Kerfuffle is in town! Hooray! The sad part is that her visit will again last for only 24 hours. I am a lucky Monkey to have been a part of the schedule. Whee! 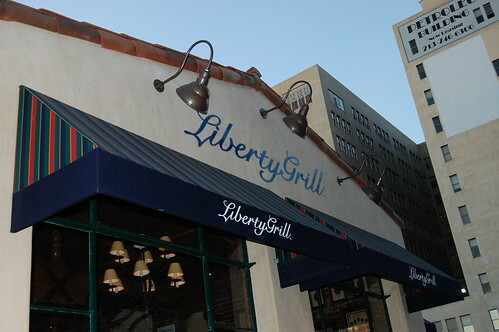 From Kerfuffle's hotel, we walked to the nearby Liberty Grill, a great mid-priced American option in downtown. And when I say "American," I'm talking really American. After all, "liberty" is in the name. 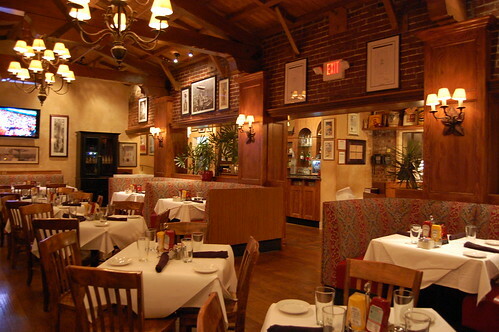 Liberty Grill is the perfect place to go for a pleasant casual meal, be it for a business lunch or pre-Staples-Center-event dinner. 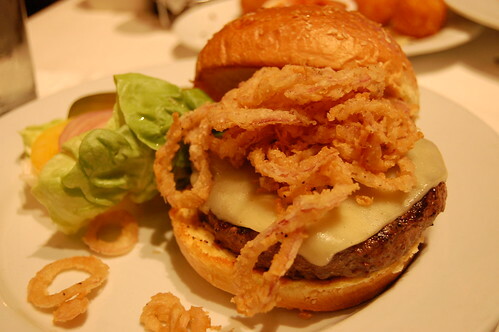 Dinner entrees range from $11.50 for a cheeseburger to $29.00 for a New York steak. There are lots of options in between. We shared Katie 'n' Megan's Mac and Cheese Bites ($9.00), which are balls of macaroni and cheese coated and fried to perfection, accompanied by a ramekin of tomato sauce. Hands down, this is my favorite item at Liberty Grill. 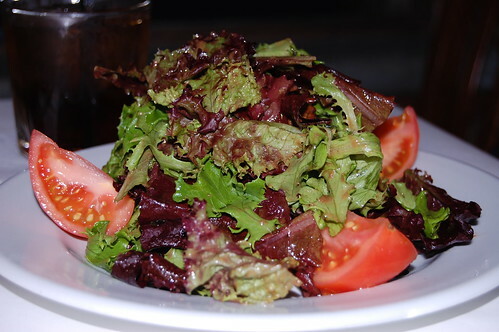 Kerfuffle started with a baby greens salad ($7.50). 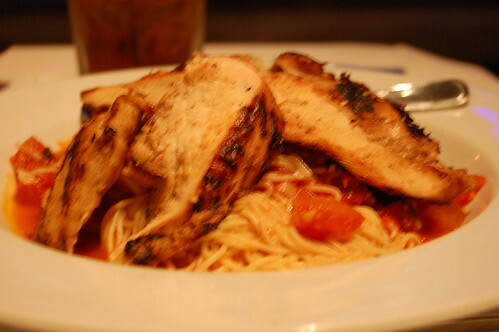 She followed that with pasta pomodoro with grilled chicken ($15.50). Sorry this pic is fuzzy. I snapped it quickly before Kerfuffle dug in! My peppercorn burger ($14.00) -- crusted in black pepper and topped with jack cheese, crispy onion strings, chipotle mayo, lettuce and tomato -- was delicious. 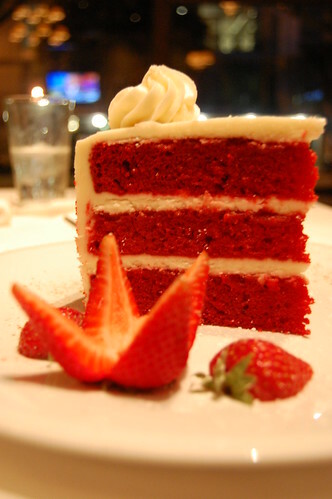 And a sweet ending -- red velvet cake ($8.50). The frosting was a bit much for me (but, then again, I feel this way about most frosting). The cake, however, was rich and moist and wonderful. Kerfuffle and I ate and drank and talked and laughed for nearly four hours. We were quite certain that the quiet older couple next to us was eavesdropping on our lively conversation. I wish Kerfuffle could clone herself and live in both L.A. and Florida. I miss her lots! your photos of the mac and cheese bites have put liberty grill on top of my list of restaurants to try asap. they look incredible! i loved fried mac and cheese especially at the fair. kinda trailer trash (excuse my un-PC term), no? I've been reading your blog this past week and must tell you that I really enjoy your blog (your writing, wit, pictures). Which mode do you use when you're taking photos with your D40? 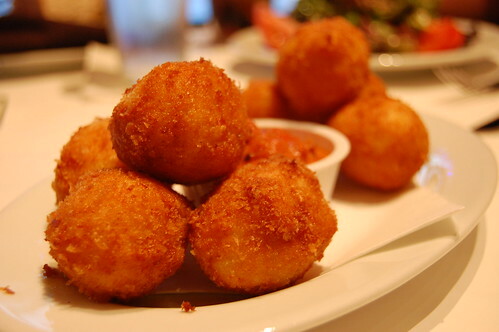 oh yum...fried mac & cheese balls. Kirsten, thanks! I am a photography know-nothing who has yet to learn how to use her camera properly! I still take pictures automatically, so my lovely DSLR is nothing more than a fancy point-and-shoot until I get a clue. Nevertheless, even while shooting automatically, you can take better food pics if you use the close-up mode, which is the flower icon on your camera. I try not to use the flash, even in low light, which often gives my pictures a yellowish look, but I often prefer this slight yellow tinge (even though it doesn't look too wonderful) over the harshness of the bluish effect you get with a full flash. 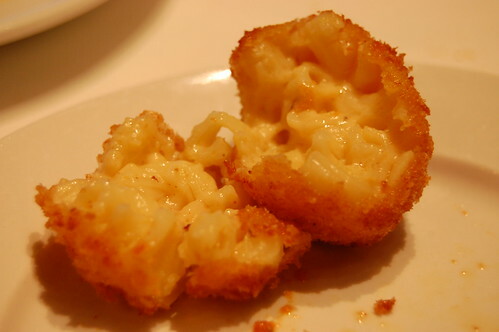 I have yet to try mac + cheese bites...I'm afraid I will eat them all day, everyday. in the meantime, I will just drool over your pics. I know what you mean about fancy point-and-shoot! I also have the D40 and haven't really ventured out of the preset modes. Since you lost your manual, these sites are useful http://tinyurl.com/26ruwx and http://tinyurl.com/4637pv. Of course you probably already know about them, but I thought I'd share in case you didn't. Is it sad that I'm dying to go to the fair because I heard they're serving fried mac and cheese on a stick. You know...I have never been there! It looks amazing. Thanks for the links, Kirsten. So sweet of you! i think i need some of those mac & cheese balls. now. i gotta make up better names for my friends. you really take the cake - pun intended.